Limelight maintains a large and diverse inventory theatrical lighting equipment available for rental at competitive pricing. Additional, special pricing consideration is offered for large orders and/or extended rental periods. Limelight meets the stage lighting needs of groups and productions, near and far, ranging from school productions to professional touring acts as well as industrial showcases and upscale special events. Send us your shop order for competitive pricing. 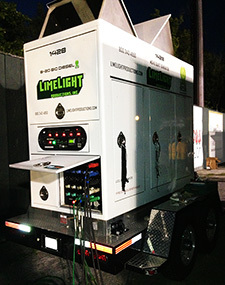 Limelight is an authorized reseller of most major equipment manufacturers including ETC, Robert Juliat, Leprecon, Strand Lighting, Colortran, Altman, L&E, Strong and Arri. Limelight Productions, Inc. maintains a large inventory of lighting equipment for film and video production For more about location lighting services for film and television, including our 5-ton, 3-ton and van grip packages, visit our industry-specific site at FilmandVideoLights.com. Movie Quiet Generators available for rent for noise-sensitive location work. With factory certification from most major dimming and control manufacturers including ETC (Electronic Theatre Controls), Strand and Genlyte Control Systems for Entertainment Technology, Limelight can provide replacement parts, professional maintenance or repair for virtually any lighting fixture, dimmer or control system. Used Equipment Sales - well maintained used equipment and accessories available for sale at affordable prices. This is an excellent opportunity to acquire quality equipment at affordable prices! Special Effects - Limelight rents sells and services most popular special effects including fog machines and hazers, snow machines, color scrollers, moving light fixtures and controls, gobo rotators, scene projectors.